Life went on at home as best it could during the Great War. The report accompanying the original photograph in this then and now image states “Huge crowds of people witnessed the annual Roman Catholic Pilgrimage from St Mary Star-of-the-Sea Church to the Chapel in the ruins of Hastings Castle. The image shows the head of the procession passing the site of the Fishmarket (not pictured – but can be seen here) in Hastings Old Town”. The church of St Mary Star-of-the-Sea in Hastings Old Town was built on the site of an old farm house that was adjacent to the Bourne stream in 1883. The original photograph was taken from the Hastings & St Leonards Pictorial Advertiser dated 26th August 1915. The Royal Military Canal stretches 28 miles from Cliff End at Pett to Seabrook at Hythe. This canal wasn’t created for trade however. It was built as a defensive line, a third line of defence against the expected invasion by Napoleon. Had he made an attempt to invade, he would first need to defeat the Royal Navy. That done the line of Martello Towers would next need to be overcome. If they made it past the towers, they would then face the Military Canal. Started in 1804, it took 4.5 years to construct at a cost of about 19.5 million in today’s money. Napoleon was defeated at Trafalgar in 1805, which pretty much ended his ambitions of invading Britain. So the canal was obsolete by the time it was finished. There is a break in the man made canal; at Winchelsea where it meets the River Brede and at Iden Lock where it meets the River Rother. The rivers take up the job of being the water barrier. It is the third largest defensive structure in the UK, after Hadrian’s Wall and Offa’s Dyke. A good defensive structure never ages, so when Britain was again under threat of invasion, this time by the Germans, it was again used as part of a network of defences. Pill boxes were constructed along its length, some of which are still around. The canal continues to serve an important function across Romney Marsh, acting as a source of water for irrigation during the summer and an outlet for flood water during the winter. It is also a haven for wildlife and fish as well as being very picturesque. It is that time of the year when Bluebells have bloomed. They can be found in many parts of Europe, from Spain to Germany and they have been introduced to the USA as well. Luckily for Great Britain, we get the dense fields of them in woodlands which isn’t as common in the other places that they grow. We have perhaps 50% of the global population of the flower. Dense patches of bluebells in forests are an indicator of ancient woodland, or in other words, the woods they grow in have been there since at least the 15th century. These woods will have developed naturally as cultivation of forests didn’t start until more recent times. There is plenty of woodland like that around Hastings and Battle. I’m lucky enough to live next door to some, and even better I don’t have to pay to enjoy them. Where ever you find bluebells there are also Wood Anemones, another flower found in ancient woodland. It too is a pretty flower, but doesn’t get the attention that the bluebell does. As pretty at it is, it is fairly poisonous, so don’t be tempted to eat one. The view from Rye Church Tower is fantastic and worth experiencing if you ever visit the town. It is accessed from inside the church for a small fee. The climb to the top takes you through very narrow passages and rickety steps. You’ll see an original 15th century clock mechanism, and a full array of the church bells. Interestingly, one of the original bells was stolen during a French raid during the 13th century. It was recovered the following year from Normandy during a raid by men of Rye and Winchelsea and put to use as attack warning bells. There it stayed for nearly 300 years before being restored to the church. The old bells were replaced entirely during the 1700’s and these are the ones on display now. 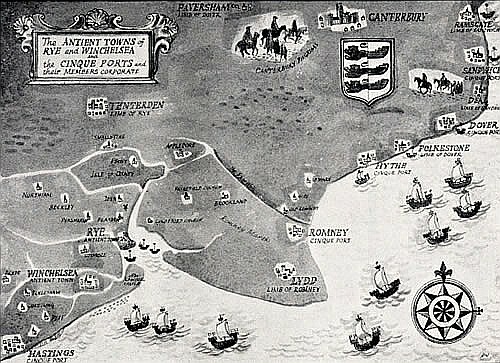 You can still get a good sense of how the town would have been when it was part of the Cinque Ports even though the landscape has changed substantially since. Â The flat land that now makes up Pett Level and Romney Marsh would have been wetlands. The Rother would have been a substantial tidal river, five or six times wider than it is now. This map provides an idea how the land used to look. I liked this view of birds on a wire. The telephone pole and wires created interesting angles in the frame. It was taken at Winchelsea Harbour. But what does the phrase ‘bird on a wire’ actually refer to? The song written by Leonard Cohen seems to have coined the phrase first, or at least brought it to mainstream attention. There are two possible meanings – if the answers on a Google search can be considered definitive. The first is a method of trapping birds by applying glue to overhead wires. The second refers to a bird that has a wire attaching one if its legs to a perch. So whilst it might be able to fly, it can only go so far. I think the second is the more plausible definition, especially when considering the lyrics of Cohen’s song, which are below. There was of course the 1990 film starring Goldie Hawn and Mel Gibson, but that is best forgotten! Several hefty cloud formations moved across Sussex earlier this week. These were patchy however and blue skies appeared in between the showers. The sun shining on these great formations of cloud created interesting skyscapes. The one moving out over the Channel from Hastings had been delivering wintery showers. These were taken along Pett Level. These clouds looked very dramatic. They had delivered wintry showers to Hastings during the day, so perhaps the cold and the wind and the heat from the sun affected how they formed. I think though that with a little imagination, you could imagine these photos depict a meteor striking the sea. The Battle of Britain Memorial at Capel-le-Ferne, Kent was built in 1993. The site is built on the White Cliffs and commands excellent views over the Channel and Folkestone. The memorial centre piece is a statue of a pilot, placed in the centre of a huge propeller created with paving stones. At the rear is a memorial wall with the names of all the ‘Few’ that were involvedÂ in the battle on the Allied side. A new visitor centre opened last year and offers an overview of the battle and a ‘Scramble’ experience to help people imagine what being a pilot was like during the battle, if a walk though and sound effects can ever achieve that. This photograph shows a great view of the area from above, and gives a good idea of the layout and design. Also on site are full size replicas of a Spitfire and Hurricane. The presence of the replica planes adds an important context to the memorial and provide a big impact on the children visiting the site. Each of these photos can be viewed full size on Flickr by clicking on them.